The world of precision motorsports is definitely worth watching, especially when you take into consideration the amount of care and detail that has gone into it. For instance, even the kind of fueling strategy used by your team could spell defeat or victory. 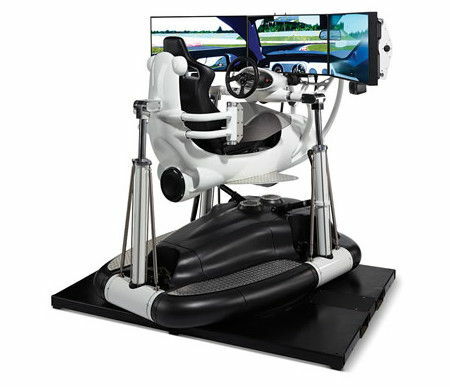 If you love the smell of burnt rubber and asphalt, but do not want to get your hands dirty with all the grime and oil, perhaps it is time to set aside your nest egg to pick up this $185,000 Most Realistic Racing Simulator. The Most Realistic Racing Simulator happens to be a simulator which will be able to offer riders with the most realistic car racing experience to date. It has been selected by Ford Motor Company in order to demonstrate ride experiences, as the simulator makes use of linear servo actuators which will enable its suspended, monocoque fiberglass chassis to roll, pitch, and rotate 360° at up to 0.5G acceleration. In other words, it has all the necessary bits and pieces required to faithfully reproduce actual racing conditions including entering a turn at 200 MPH, or perhaps to move up a bank in the slipstream of an opponent. You will notice that the chassis’ front dips when braking at hairpins, and pushes forward when accelerating during passes. As long as you do not tip the scales at more than 300 lbs., the actual racing seat, seatbelt, and “doors” should be able to keep you nicely secured. Other features include a pair of paddle gear shifters, a steering wheel, accelerator, brake, and clutch, all of it taken from real race cars and modified for simulator use. At this price, it packs far more punch compared to the Full Immersion Professional Racer’s Simulator. It is said that the force-feedback steering system is capable of generating 10x the forces of lesser simulators, where there are a dozen race cars to choose from that include stock, GT, F1, and F3 models, with the simulator replicating precisely modeled signage and backgrounds for 16 short, tri-oval, or road courses. Your eyes will be teased by the 108″-wide, triple HD monitor display and ears appreciate the 500-watt audio system.